Will there be a show on artists and copyright at the largest arts festival in the world? Yes! 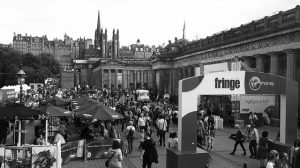 Dr Smita Kheria (University of Edinburgh) is taking the research findings from her CREATe project on ‘Individual Creators’ to Edinburgh Fringe 2017. The show is inspired by her fieldwork conducted at the Edinburgh Festivals, including the Fringe, in 2014 and 2015. Provocatively titled ‘No copyright, No Problem?’ the show is a part of the Cabaret of Dangerous Ideas. Smita will be drawing on extensive empirical research on the perspectives and practices of individual creative practitioners (writers, illustrators, and visual artists) to ask whether copyright matters or could we live without it. She asks; Is copyright necessary? Does it hinder or does it help? What would happen if there was no copyright? Without it, who benefits and who loses out? Is copyright just for corporations? Or does copyright also serve the interests of individual creators more effectively than we might think?